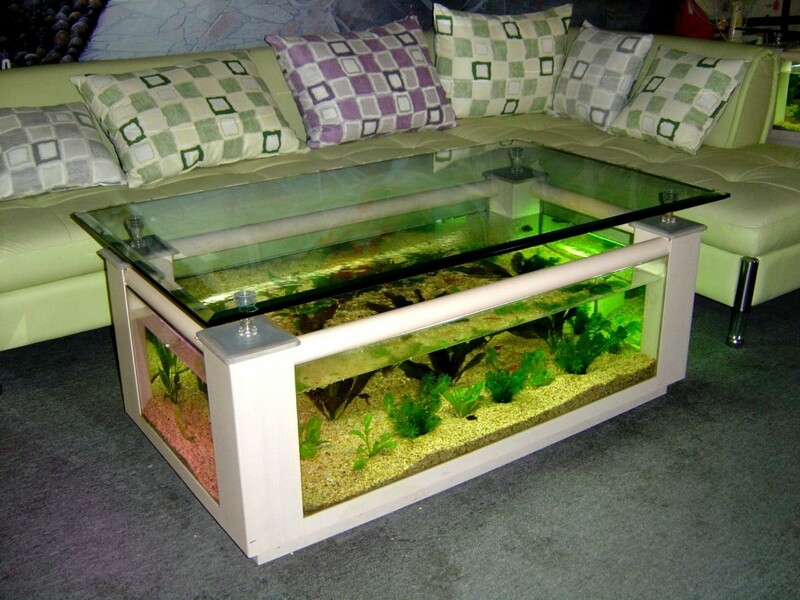 There are five best aquarium coffee tables for your picking up. They are durable, fashionable, and beautiful. They all are mixture combining fish tank and table. 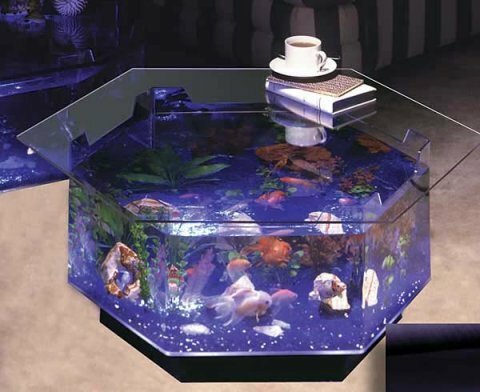 Have you imagined that you have a fantastic table that you can see fish swimming in it? Now, that idea has come true. 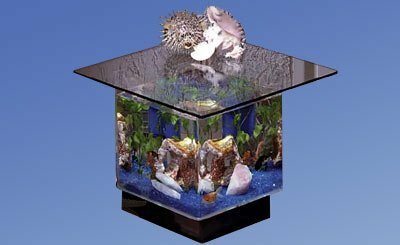 We have select five best aquarium coffee tables for your picking up. Please enjoy the experience of selecting. The Midwest Tropical Square coffee table is illuminated from below a bed of blue glass gravel. It is shaped to fit your interior placement. A solid 3/8’ tempered 36 square glass top completes the system designed to provide years of enjoyment. 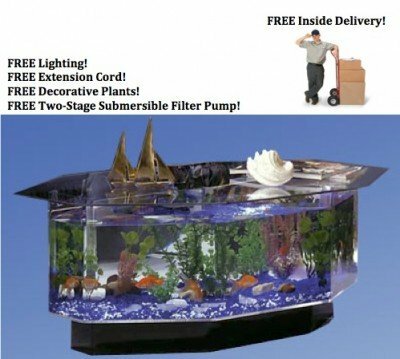 Complete with lighting, extension cord, decorative plants, gravel, and two-stage submersible filter pump and easy-to-follow instructions. This specially styled coffee table has six sides offering plenty of clear viewing along with the glass top that is also functional for use. It’s an amazing setup that incorporates feeding slots in the sides and lighting from beneath the blue gravel which includes 1 filter, 1 plant, blue glass gravel, light for under the tank. 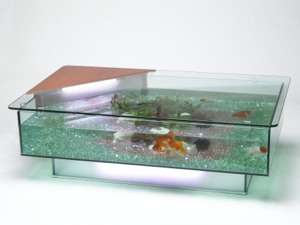 This table aquarium put you in a truly sit-back-and-relax mode after a long day from your work. Built-in ecological filtration system lets you enjoy your aquatic animals virtually care-free year long. Additional shorter under-glass-top supports are included in case you want to lower the glass top to have smaller gap between the glass top and tank top edges, thus to prevent your cat or child from reaching into the water. This ever-changing aquatic habitat readily creates a relaxing atmosphere while offering everyday utility. Resting on a black acrylic pedestal, each table aquarium is illuminated from below a bed of blue glass gravel. A solid 3/8′ tempered 24 square glass top completes the system designed to provide years of enjoyment. 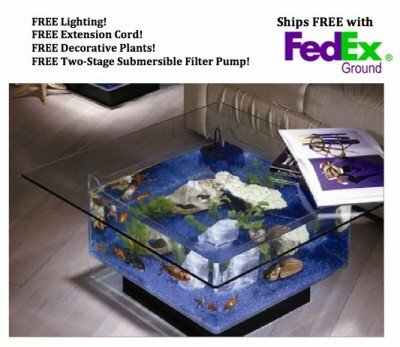 Complete with lighting, extension cord, decorative plants, gravel, and two-stage submersible filter pump and easy-to-follow instructions. This table offers a relaxing atmosphere. It is illuminated from below a bed of blue glass gravel. Complete with pump, lighting, extension cord, decorative plants, and two-stage submersible filter pump. A clear, acrylic top completes the system designed to provide years of enjoyment. In addition, the product dimensions are 30*30*16 inches.